UV Skinz, a leading provider in sun protective clothing, will include a special edition “My First Skinz” Baby Sun Shirt (size 12/24 months) with every order placed during the month of May with the hopes of raising skin cancer awareness and encouraging sun safe habits among families. A single severe sunburn during the first 15 years of life doubles that child’s risk for developing melanoma later on, so it is critical children are adequately protected from the sun at all times. 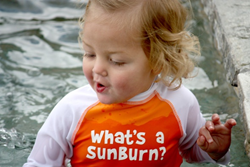 Each May, sun protective clothing company UV Skinz, holds their annual “Save a Baby’s Skin Campaign” where they give away thousands of baby sun shirts to customers as well as to pediatric offices and skin cancer awareness events throughout the U.S. The company began after Rhonda lost her 32-year-old husband to melanoma, the deadliest form of skin cancer. The devastating loss of her husband has since fueled Rhonda's passion to prevent other families from experiencing the same fate her family has, and encourages the UV Skinz team daily to continue their efforts to raise melanoma awareness. To receive a special edition baby sun shirt, simply place an order on the company's website during the month of May, and a 'My First Skinz' sun shirt (size 12/24 month) will be automatically included with your order, no coupon code necessary! UV Skinz offers a complete line of infant, children, and adult sun-protective clothing and accessories. In addition to providing high quality sun protective apparel, UV Skinz, Inc. donates to hundreds of skin cancer awareness organizations and education events annually. For more information about the company’s mission, sun safety advice, or to purchase products please visit http://www.uvskinz.com.